Last week I started taking French lessons (I guessed it was about time to get serious with this living in Paris malarkey) with a real life french person! Sitting in a cafe I had to face my biggest fear (one that I have been avoiding since starting to learn french), conjugating verbs. I don’t even really understand what ‘conjugation’ is but it’s all people seem to talk about when learning a language and so I was set the task of learning some of the most common ones for my homework. ‘I am’, ‘you are’, ‘we are’, ‘he is’, ‘she is’ and all those fun things that really do help when it comes to putting sentences together. So, after doing my best to learn the ones I had been given, I set off bright and early this morning to meet her once again for my lesson. But in the -2 degree weather, my brain managed to completely shut down and I trundled off, following my google maps to the complete wrong place (the same place I had no problems finding last week). When I arrived at my incorrect location, I realised I was on time for my lesson but no where near where I was actually supposed to be! So I called and apologised and said I would jump on the Metro and be there in fifteen minutes. Thankfully, I thought the correct cafe was only a few stops away from where I was and so all was not lost! Twenty minutes later, I surfaced from the Metro and proceeded to run up and down the street looking for a cash machine in order to be able to pay for the lesson (which would now only be 45 minutes due to my brain freeze). Money withdrawn, I continued running to the point where google maps told me the cafe was. But when I arrived, despite having the same name on the door, I very quickly realised that this was not the cafe I had been at last week. I was yet again at the wrong place and on the other side of Paris to where I should have been. With freezing fingers and blisteringly cold ears (that I couldn’t be sure were even still attached to my head), I admitted defeat and sent a grovelling apology to my teacher, explaining I was an idiot and the cold in fact had bothered me anyway and I wasn’t going to make it to her. I headed home, €35 poorer (as of course I still have to pay for the time I wasted) and with nothing to show for it. So I grabbed a warm baguette from the bakery and took it home where I ate, whilst defrosting my ears in front of the fire, contemplating my stupidity. 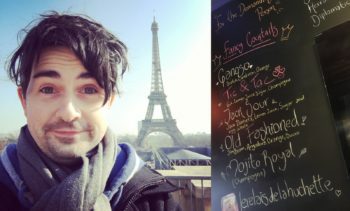 I’ve live in Paris for 2 weeks… here’s more things I’ve learnt!